The Beefsteak Dinner originated in 19th-century New York City as a political fundraiser, but it went into a decline in the mid-20th century, only surviving in the small towns of Northeast New Jersey. 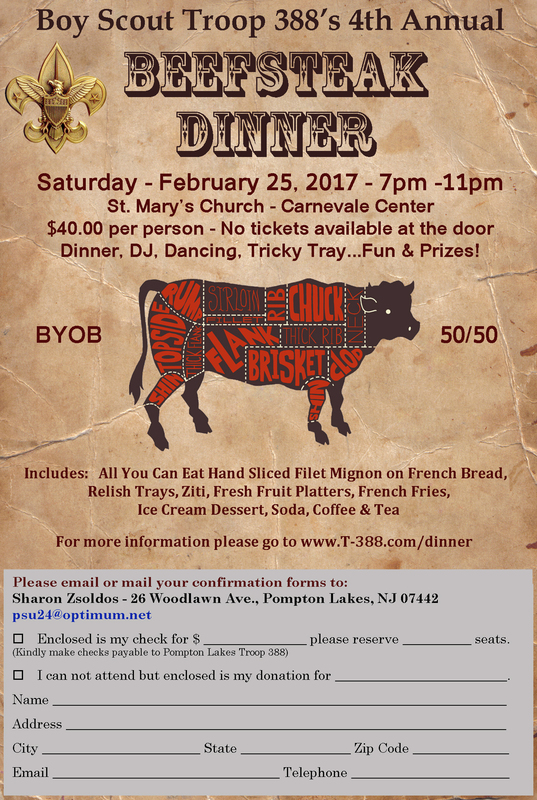 Today the Beefsteak has enjoyed a revival in New York City and North Jersey, and Troop 388 will be continuing the long tradition with our third annual Beefsteak Dinner fundraiser. It will be held from 7:00pm-11:00pm on Saturday, February 25 at the Carnevale Center. There will also be a DJ, dancing, and prizes! The dinner is BYOB, and will cost $40 per person.